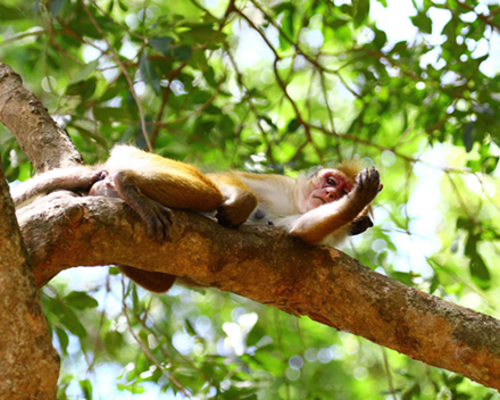 The Toque Macaque is a commonly found monkey in Sri Lanka. The Sri Lankan Toque Macaques (Macaca sinica) are the smallest species of Macaca, a golden-brown coloured monkey, endemic to Sri Lanka. Locally known as the “Rilawa”, it is easily distinguished by the toque-shaped swirl of hair on the top of its head, with the amount of hair on the top of the head being geographically variable within their range. There are three recognised subspecies of Toque Macaque; dry zone Toque Macaque (M.s. sinica), wet zone Toque Macaque (M.s. aurifrons) and the highland Toque Macaque (M.s. opisthomelas). They live in troops, sometimes numbering up to 20 members, the dry zone subspecies has earned the nickname “temple monkey” as they are commonly sighted in the Cultural Triangle of Sri Lanka, where many ancient monuments including temples are situated. This subspecies has been the subject of one of the longest behavioural studies of any primate species conducted in the world. Physical characteristics of the Toque Macaque vary depending on their habitat. They have a golden brown coat on their top (dorsal) surface and white hair on their underside (ventral surface). This white coat extends to the cheeks and around the ears. They have a long tail that is blackish brown dorsally and pale white ventrally. Toque Macaques have muscular cheek pouches that are used for storage during foraging. These pockets are lined with mucous and the muscles serve to push the food back into their mouth. Their faces are hairless, ears and lips are black; the males have a tan face, while females have different shades of pink. Males are larger than females and complete their development later. (dry Zone subspecies) – the radiating hairs on the cap are short and entirely golden brown in this subspecies. The dorsal area and outer limbs are chestnut in colour overall. (wet zone subspecies) – the radiating hairs on the cap is longer and untidy; the anterior part yellowish, contrasting with a darker, browner posterior part. General colouration of dorsal area and outer limbs are dusky yellowish. (montane subspecies) – the radiating hair of the cap are long (around 110 mm) and straw coloured. The general colour of the dorsal area and outer limbs is greyish-olive. Average body length is 35-53cm and tail length is around 40-60cm. An adult male Toque Macaque weighs 4 - 5.5 kg on average, and females can weigh up to 2.5 - 4.5 kg. They are diurnal terrestrial quadrupeds, and spend much of their time moving on the ground. They are equally agile on the trees, where they sleep, sometimes huddled together. The toque macaques can also swim proficiently, and may even hide underwater when escaping predators. Toque Macaques are omnivorous and like to eat fruit, seeds, nuts, mushrooms and occasionally reptiles and birds. They use both hands to stuff food into cheek pouches and will store food there to be chewed later. The Toque Macaque can be found in a variety of forest types, at altitudes up to about 2100 m, depending on the subspecies. Toque Macaques are also very well known to raid crops and garbage dumps and are not often frightened away by close encounters with humans. The species as a whole is endemic to Sri Lanka: M.s. aurifrons is found throughout the wet zone and central highlands, M.s.opisthomelas is found in the montane rainforest around Horton Plains and its environs, M. s. sinica occurs throughout the Dry Zone. The major threat to these species is extreme habitat loss and habitat fragmentation due to development and urbanisation. This decreasing species is currently on the IUCN Red List and is protected internationally under CITES Appendix II. However, enjoys very little protection as it is considered to be a pest to crops such as coconut etc. They are not protected by local laws and happen to be the only endemic species to not be so.